See my links to the right to access a treat--blogs by Felix and Giles! Beat all ingredients on low for 30 seconds. Beat on high for 2 minutes. Pour in greased, floured pans (two round layers, 13 x 9, or Bundt) and bake at 350 for about 30 minutes (longer for single-pan cakes). To frost: soften 1/3 c. dairy-free margarine, sift in 2 c. powdered sugar and 1/3 c. cocoa. ådd 1 1/2 t. vanilla, and as much water (around 2 T.) as necessary to make a nice soft spreading consistency. So easy a ten-year-old could do it! "She was. . . in that unreasonable frame of mind which the best of mothers occasionally experience when domestic cares oppress them, want of exercise robs them of cheerfulness, and too much devotion to that idol of American women, -the teapot,- makes them feel as if they were all nerve and no muscle." ". . .Do more housework. You need the exercise. . .Go out more; keep cheerful as well as busy,-for you are the sunshine-maker of the family, and if you get dismal there is no fair weather." "Meg recovered her spirits, and composed her nerves, by plenty of wholesome exercise, a little pleasure, and much confidential conversation with her sensible husband. . .Home grew home-like again, and everyone found the little house a cheerful place, full of happiness, content, and family love." Thinking about this passage always makes me wonder if I am devoting myself too much to my teapot. It's a danger. Yesterday was Big City Day for us yesterday--a trip to the zoo, a stop by the big antique mall, and then dinner with Grandmother (best barbeque ever--yum!). It didn't take Daisy long to catch on at the zoo, the idea being that everywhere you go there are Animals. Zebras. Monkeys. Elephants. The antique mall was delicious, especially my mother's booth which as usual made me want to buy everything in it, even things I had given her to sell. I did score a great vintage mirror, a stack of twelve white damask dinner napkins which I will monogram by hand, and eight silver spoons engraved with "Helen" on the handles. Helen can help fix my tea in the mornings, I think. The Composer lighted on a particularly lovely vocal piece the other day, the "Pie Jesu" from Faure's Requiem, and zipped it down to the kitchen computer where I do my poking around, usually while nursing Daisy. So I was playing it today while Daisy refreshed herself, and I looked down to see that she was doing her perfect snapping (this has been her showstopper since she was about 11 months old) in perfect time to the very slow adagio tempo of the piece. Later, while it played again, she laid her head down on the Composer's shoulder and held perfectly still and quiet to listen to the entire thing. It was definitely a moment. "The top landing gave a charming vista of three pretty rooms and a white tiled bathroom all flooded with the spring sunshine, as if a dozen suns were shining in as many different directions. They were airy rooms, with muslin-curtained windows, simple wall paper, neutral-tinted rugs and white furniture, with a touch of color in the borders of the wall and curtains, the cushion on a rocker, a knot of ribbon on the dressing-table. One room was rosy-tinted, one was white and gray, and the third a dainty blue, the wall bursting into a shower of cherry bloom over a deep sky background. 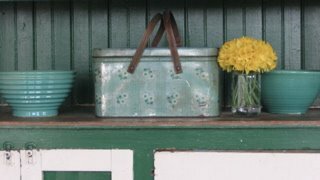 . ."
The jaded city heroine has gone out to the suburbs to visit a friend who married "beneath her" and now lives in a little nine-room bungalow--only to find her friend revelling in the joys of domestic life in all its bungalow glory. . .
My new best friend in the kitchen is my box of latex gloves. I started out using them for handling raw meat. Then I started pulling out a pair when it was time to chop an onion. Then for garlic peeling. Now I use them whenever I'm going to do a bunch of cleaning or wiping. And all along I've been using them in the garden--I always have an extra pair stuffed in the pocket of my garden apron. I love peeling off all that dirt/bacteria/onion smell and tossing in in the trash can so effortlessly. I try not to think that I am probably setting us all up for severe latex allergies. Hope not. For several years I have had a rusty can of "Fume-Free" oven cleaner sitting on a high shelf, and I would pull it down every six months or so when the stovetop finally got too nasty to stand. I would spray it on, trying not to breathe in the nasty fresh lemon-scented poison gas fumes, leave it for a few hours, then wipe off *some* of the gunk from around the burners. I just did that for the last time! Because when I finished, and still couldn't get off the most stubborn cooked-on junk, as a last resort I sprinkled some baking soda on the stains and wiped with a damp cloth. Yes, you guessed it, everything came off with a gentle swipe. No toxins. No waiting. No explosive can. From now on, it's baking soda every time. ". . .a testimony. . . But keep His commandments. . ."
Here's my great mirror find from earlier in the week. Today's project was piddly--just a new quilt chosen off the shelf and folded over the armchair in my room. The colors are nice with the lavendar walls. I find that a week is a long time to try to keep my attention focused! In view of the coming icy weather, Clara and I stocked the pantry with many baked goods today. Five dozen chocolate chip cookies (the boys and the Composer really put them away), four loaves of bread, and five pans of sticky buns. Because you never know--the power may go out and we might not be able to bake. Gasp! Clara also made a cake completely on her own, a lovely spicy applesauce cake which tomorrow she will ice with lemon icing. We don't need it today because we are still eating the yellow layer cake with chocolate frosting (all from scratch) that she made yesterday. A repeat of Wednesday's cake which was taken to our Bible study. Who can stop her? These are the best roses ever. They are slowly opening instead of drooping, and they are wonderfully fragrant. The living room with its "new" round table. Today's accomplishment was a nice arrangement on what we call the Green Thing--an enormous oak cabinet in the sitting room. The Thing weighs at least 400 pounds--the Composer and my big brother Josh moved it here from town and never once got it off the ground. Interestingly, when I purchased it, the little lady behind the counter at the antique store assured me that she brought it into the store from her truck all by herself. Hm. Clara and Bella picked all the daffodils they could find this morning in preparation for the weekend ice storm coming up, and I got my favorite vintage picnic hamper down off a high shelf. I am so running out of ideas! Although I did come up with the brilliant idea of putting up a nail in the kitchen to hang my apron on. I put it on and take it off a dozen times a day, and I when I want to put it back on I usually end up hunting all through the front of the house to find where I laid it. A consistent hanging spot will be nice. 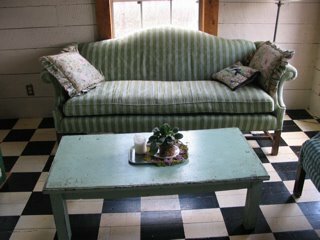 Here's a picture of the sitting room, with its "new" green table from day one. Love that floor! My father painted it twenty years ago and the only drawback with the squares is that you can see how *out* of square the house is! I'm barely squeezing in under the rules tonight--after a *very* busy day, my decorating consists of arranging and setting out the beautiful flowers I was given for Valentine's Day. They didn't cost *me* anything, so they count. The pot of bright rose-colored tulips from Felix are in a green pottery bowl on the dining table, and the pink roses from the Composer are tied in a bunch with string and plopped in a glass pitcher on the round table in the living room. I think it is my first Two Bouquet Day ever! When we were checking out at Wal-Mart yesterday, Felix put his purchases up on the counter--a big bale of cedar chips (for his chicks), a fifty-pound bag of sunflower seeds (for his bird feeders), and the lovely blooming tulips (for his mother!). Giles remarked drily that it looked as though Felix had a girlfriend--and she's a really big hamster. I was so proud of Clara tonight when she played her cello with the university's wind ensemble in a Valentine's Day concert. They played Bizet's Carmen suite and a beautiful Mozart clarinet concerto. She's only ten years old, but she did a wonderful job playing alongside the professional musicians and college students. And Bella was so good beside me, listening (and using up her new neon-colored post-it notes). 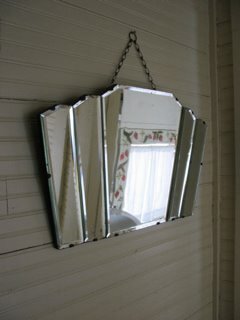 Yesterday I hit the jackpot--an antique mirror that had been languishing away behind bric-a-brac on Clara's dresser, actually invisible to the naked eye because of all her dresser accessories, made its way downstairs into the hallway and was hung on the wall right where the hall turns the corner. This is a fabulous mirror--a geometric fan shape, heavily bevelled, speckled with those old dark mirror specks, and straight out of the 1930's. Today was less spectacular. I tossed a rabbits'-foot fern that had long been fighting a losing battle with scale, right beside my bed, and replaced it with a healthy Boston fern which has been flourishing, unappreciated, in a bank of ferns in the living room. Go team! Giles tilled one of our vegetable garden squares this afternoon and planted a packet of spinach seeds. We have had good luck in the past putting spinach in around Valentine's Day. They grow their little rosettes and then wait for warm weather and really produce a lot before bolting in the heat. Waiting til warm weather means that the spinach will immediately bolt, here in Zone 7. We're looking forward to our first garden salad, and Giles gets the credit. •it must be more substantial than decluttering or tidying--it should last overnight! I got off to a great start today in the sitting room, which is the entry room to our house as well as a cozy room where we spend lots of time reading on the couch and looking out the windows at birds, deer, and weather. Daisy likes to get in there and dump out the massive contents of her a) giant book basket and b) huge basket of stuffed animals. •stitched new fabric over the worn, shredded, embarassing arms of the armchair. 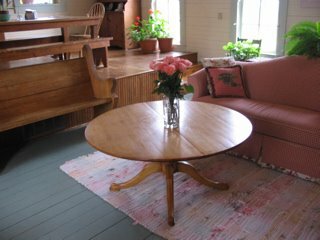 •moved out a large round low table that took up too much space (it went to the living room) and moved in a pale green primitive coffee table (it had been in the living room). •Giles got in there with a hammer and screwdrive and pried a bunch of unused curtain rod holders and curtain rod dowels out from above the windows. He also removed six or seven nails that had been sticking out the side of a big green primitive cupboard in the sitting room. Thanks Giles! I hope for many more ideas to come to me in my sleep, as now I have none. Six days to go! After the angst of the first three days, Felix has taken a deep breath and realized that the eleven surviving chicks are healthy and going to make it. They look so cozy in their cardboard box under the light bulb! He set them up in the workshop under the kitchen--a space which is heated and accessible from inside and fortunately has concrete floors and a door that latches, as the cats have both expressed their interest in helping with the new project. 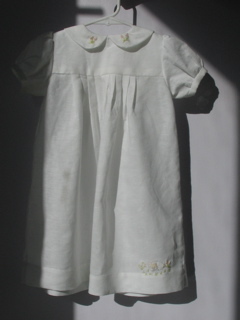 Here are photos of Daisy's Easter dress, the first to be finished. I had so much fun doing the embroidery. I made several changes to the pattern: lined the bodice instead of using bias tape binding, pleated the skirt instead of gathering, and gathered the sleeves into sleevebands rather than using elastic. 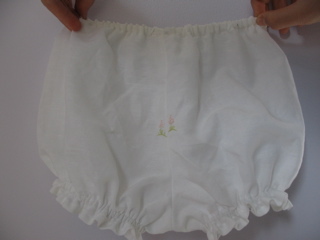 The fabric is handkerchief linen. Opening out of the master bathroom we have an odd-shaped closet which is just the space under the stairs, with shelves added. We use it store a mix of toiletries that we use every day, travel supplies, extra cleaning supplies, and, of course, canning jars. It never seems clean as it generates lots of dust and most remarkably suffers from a constant downdrifting of fine black grit from what appears to be tarpaper covering the stairs, under the stairs' carpet. I attacked it today and tossed two sacks worth of old almost-used-up lotion, plastic foot massagers in duplicate from various pedicure kits, and old cleaning cloths. Dusted everything and vacuumed, and now am marveling at my industry every time I go back there. The satisfaction of fixing up a dirty, cluttered spot casts a glow over the whole back of the house. Felix's chick day finally arrived. He was up at the crack of dawn to await the phone call from the post office alerting him to the arrival of his chicks, with a cardboard box warmed and ready to go, a bed of leaves and newspaper, and a feeder with fresh chick starter and a water bottle all set. 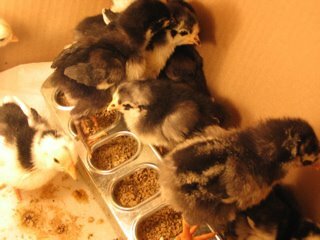 "The day has been rather stressful because the chicks had a hard trip and some of them were dying and it was kind of hard to figure out what was going on. I think I've figured out what the problem was--that the chicks got chilled on the way here, but all the larger chicks have survived and are quite healthy," says Felix. Fortunately, McMurray Hatchery will replace any chicks who die within three days of arrival, so it looks like Felix will be anticipating another sunrise phone call in a few weeks to make up for the Golden Polish and Egyptian Fayoumis who didn't quite make it. I recently acquired a copy of America's Cook Book compiled by The Home Institute and The New York Herald Tribune, copyright 1940. So fab and a wonderful menu-planning chapter. "It is good management to plan or assemble menus for a week or at least several days at a time. However, they should be kept elastic enough to allow for using up unexpected left-overs and to take advantage of special food bargains. In the morning plan the work for the day so that some foods may be prepared ahead to save time. Make out a tentative marketing list. Check supplies on hand against the daily order sheet [I wish!]. . .Menus once planned should be smoothly executed. Start early the food that takes longest to prepare or cook. Decide what foods can be prepared in advance for last-minute reheating and serving. . .And finally--do not be afraid to try new ideas and recipes." 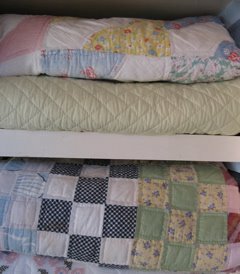 A small section of the quilts on the back hall shelves--all three of these were vintage tops that I found already pieced in antique stores, brought home and layered with batting and a back, and then quilted by hand. The middle one that looks like a solid pale green has appliqued butterflies made out of silk scraps on it and is wonderful but fragile. The other two are in common use. I haven't been quilting much lately, mostly because I have too many quilts! I credit my grandmother with teaching me how and making me think it a normal part of everyone's life. I have been so pleased with the bouquet of Gerber daisies I purchased last weekend. They're a beautiful fresh peachy-pink, and the stems are at least twelve inches long, even after trimming, and came individually inserted into clear plastic tubes for support, which I left on (they don't show). They look both festive and sophisticated in a plain glass cylinder on the dining table. Seven days after coming home with me they are still fresh and charming. 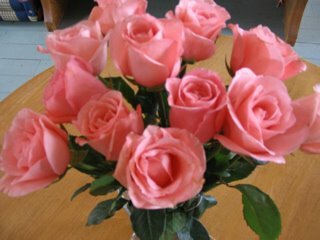 I have also learned to shop for flowers on the days the new deliveries come in--Tuesdays and Saturdays. Lots of times the florist will throw in an older bunch free of charge, if I ask for "anything she's getting rid of." She's such a nice lady; she always makes a balloon for Bella even when we don't buy anything. ". . .Kathie was bending over the table to arrange a great dish of fruit. 'Look, mother, pink grapefruit, Florida oranges, lovely red apples, and see these luscious yellow bananas. They have sunshine in their skins.'" I do love these glimpses into domestic life of sixty years ago. And it's true, the fruit is beautiful this time of year. I added a bag of blood oranges to the above list, as I'm sure Kathie would have. Now that it's February I'm not embarassed to admit that I have bought even more fabric, this time for the girls' Easter dresses. 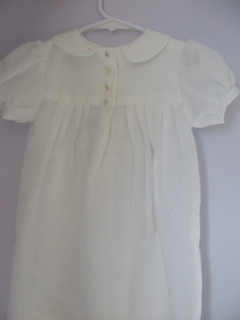 Daisy will be wearing white handerkerchief linen and Clara and Bella will have matching white cotton sateen dresses. 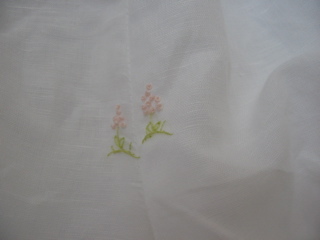 I've gotten started on Daisy's dress and am having so much fun--I'm adding a little embroidery. I picked up a copy of Sew Beautiful magazine this week and was inspired. 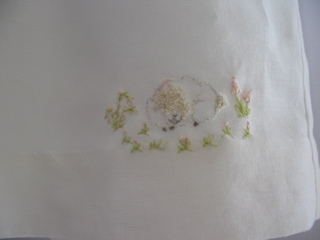 I'm using their design for a little lamb asleep in pink flowers near the hem of the front, in very pale colors--actually this is on the cover of the magazine and visible at the magazine link. I'm also adding tiny pink hyacinths to the front of the peter pan collar, and little clusters of pink French knots to the back of the collar. So sweet! 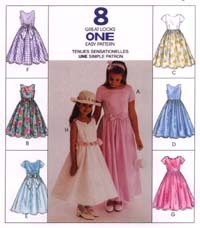 The big girls' dresses will be from McCalls 8675 (see above), with a little lace around the sleeves. I love the fitted waist and think the girls will enjoy wearing them, with the lovely circle skirts below.